During the summer, I am the world’s slowest knitter. This is fact. I’m slow during the winter. I’m the slowest during the summer. Last summer I knitted nothing. This summer, I have couple of projects casted on but I can mark one of the list. A little different, very fun and oh-so-cute, I made a striped stocking cap. It reminds me of something Ebenezer Scrooge would wear to bed. Only striped. But cuter. And cozier. And pint size. The interesting thing about this hat is it’s made from the top down. I was hesitant about doing an entire project that included M1 stitches throughout, but that’s the best way to learn. And learned I did. I knew I didn’t want to do bar increases because of the stockinette but I struggled with the knitted increase. After I huffed and puffed, Susan and her crafting prowess came to my rescue and showed me the correct way. I had left out a minor detail in the stitch… a detail that left no peek-a-boo holes… I conquered the Make One, people. The stocking cap finished up very nicely though and I loved the final look of the piece. I can’t wait to see it on someone’s little head though in a few months. In other words, I NEED PICTURES! 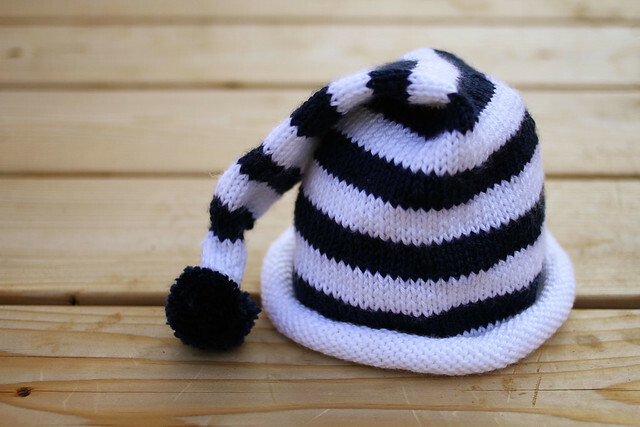 *Pattern: Striped Stocking Cap by Deb Gemmell from Baby Knits Head & Toes! Amanda - I understood about two sentences in that post. But i know whose little head will be wearing the hat and think that is so sweet!! I have no idea what any of that mumbo jumbo meant… except that it means a SUPER CUTE HAT ended up on my porch earlier this week. The surprise and the sweet card brought tears to my hormonally pregnant eyeballs! It’s hanging in Beck’s room right now waiting on his mom to take a picture of it and blog about my sweet blog friend. It’s also waiting on his sweet little head to get here so he can be photographed in it! Brooke, You are amazing and so thoughful to work so hard on something for a girl and baby you have never even met. The WWW never ceases to amaze me with the wonderful people hanging out inside of it! I am so thankful to have found a group of wonderful bloggers (and girls I can call friends) out there in internet land. I only hope that one day we can get you down here to the south and I can hug your neck in person!